Unfortunately, tickets are sold out. Waitlist is open, though. This production is the closest you will ever get to see ABBA! ARRIVAL from Sweden was founded in 1995 in Gothenburg, Sweden. 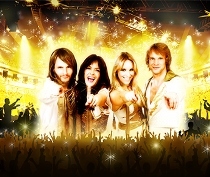 This band very soon became one of the world's most popular and most selling ABBA show band. This show is the absolute best and most authentic ABBA show there is. Hits like: Dancing Queen, Mamma Mia, Take A Chance, SOS, Money Money Money, Fernando, and many more are delivered with such accuracy that it's hard to believe that it's not the real ABBA on stage. Not only do they have exact copies of the original staging clothes of ABBA, they are the only group who has been given an unreleased ABBA song. The song "Just A Notion" is soon due for a worldwide release. 6:30pm - Meet at the Ginger Exchange Restaurant, 250 Huntington Avenue, across from Symphony Hall (drinks and a light dinner are included in your ticket). 8:00pm - POPs start. We have a group of seats together in the first balcony. NOTE: Tickets are for Sloan Alumni and one guest only.